For your school-aged child, learning spelling words can be a drag at the best of times. Often the traditional way to learn spelling words is to Read – Write – Cover – Say (or something similar). The old pencil and paper method has me yawning just thinking about it. Children learn through two major functions – play and sensory input. If we combine these, we can often think of fun, motivating and relevant ways to help children learn easily. Have a look over the following 10 ‘sensory spelling ideas’ and choose some of your favourites to try this week during homework time. Disclaimer: we are not suggesting to throw away the pencil and paper for ever! No – learning to write with a pencil is an essential part of school work. Use the following ideas in conjunction with hand writing simply to spice things up! ⦁ Use a jump rope to practice your spelling words, vocabulary words, or even your math facts. Write the words on a piece of paper or white board, etc. While looking at the word, spell the word while jumping rope. ⦁ Use a basketball or other ball to practice spelling words or math facts. Write the word on something. You can bounce the ball while spelling the word, throw the ball back and forth to someone spelling the word, or play “horse” where there is a basketball goal. 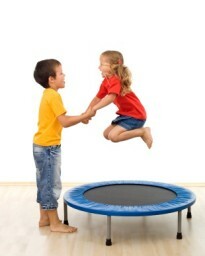 ⦁ Practice any concept by jumping on a trampoline. As you jump, spell out the word, etc. 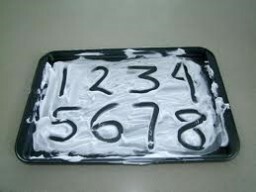 ⦁ Use pudding, sand, salt, shaving cream, any kind of texture like sandpaper, carpet, etc. to practice spelling words, math facts, etc. Pour some salt in a cookie sheet. Move the pan so the salt is distributed equally. Then have your child write the word while naming the letters. ⦁ Rainbow writing with crayons or paint: Write the spelling words with one colour. Next, while using a different colour, trace over the first colour while naming the letters. Then trace over the letters again. It makes a rainbow word. Do not use black or brown. ⦁ Use a typewriter, a keyboard, or a computer to practice words. Have your child name the letters when typing the words. ⦁ Magnetic Letters: Use plastic or magnetic letters to practice making words. ⦁ White boards or chalkboards: Children love writing on white boards or chalkboards. They can use sidewalk chalk and practice on a sidewalk. ⦁ Writing on your Back: With your finger, write a spelling word on someone’s back. Then have the person guess what word he wrote. Take turns doing this activity. Let us know what your favourite one was. If you think your child may need further assistance with their school work, sensory processing, or fine motor skills, we recommend getting in touch with an occupational therapist. They specialise in helping your little one improve these skills. For more information, contact KinderCloud Online Allied Health for Children on 0409 279 728 or email info@kindercloud.com.au.